Hi, I’m John Burrett, of Haiku Analytics Inc., Ottawa. One serious problem with logic models is that they usually leave out external influences and feedback effects, even when they may be important, because they make the model “too complex”. It is good to simplify, but ignoring important influences on program success when planning an evaluation may lead evaluators to fail to collect important data and to misinterpret results. Trying to embrace complexity by drawing a web of boxes and arrows is not helpful: it’s too complex to use and explain and will drive your audience away. This will probably come only from the mind of the evaluator or program manager, thereby easily missing important external influences and other complexities. Hot Tip: I recently stumbled onto an alternative approach during a mapping of factors of cause and effect related to a complex policy problem. Data was obtained from an expert panel, developing a matrix linking a number of factors with an estimate of strength and direction of relationship between them. Mapping this with network analysis software helped the panel to visualize what they had created. The ultimate outcome of increased employment. 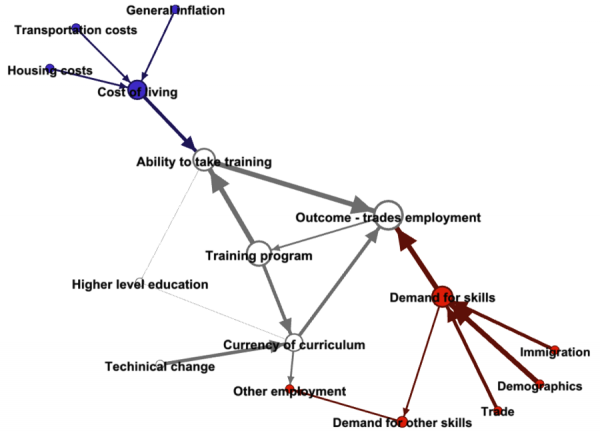 Exogenous effects influencing these results include cost of living, demand for skills and technical changes affecting the training’s currency. The size of the nodes indicates betweenness centrality, identifying those factors that connect many influences, thus propagating certain effects. The width of the edges indicates the hypothesized strength of influence. Possible unintended effects and a feedback loop are also shown. Lesson Learned: A key advantage of this approach is that that it creates a logic model using expert knowledge, rather than simply an evaluator/manager’s understanding of a program. This could also include other sources of information like findings from literature and program stakeholders’ experiences. Importantly, you could do this without imposing any prior idea of the logic model on those providing the cause-effect data other than including the program/outputs/activities and specifying the immediate/intermediate and ultimate intended outcomes. A second major advantage is that the logic model utilizes network metrics generated from the data, so how the program and influences are expected to be related can be analyzed. For instance, factors that are thought to have an important role in propagating effects across the system would show high betweenness/eigenvector centralities. The American Evaluation Association is celebrating Social Network Analysis Week with our colleagues in the Social Network Analysis Topical Interest Group. The contributions all this week to aea365 come from our SNA TIG members. Do you have questions, concerns, kudos, or content to extend this aea365 contribution? Please add them in the comments section for this post on the aea365 webpage so that we may enrich our community of practice. Would you like to submit an aea365 Tip? Please send a note of interest to aea365@eval.org. aea365 is sponsored by the American Evaluation Association and provides a Tip-a-Day by and for evaluators. Thanks for this Rick; it’s a good point. Fortunately, the software used for generating network maps is fully set up to filter and highlight using whatever attribute or metric you’d like.